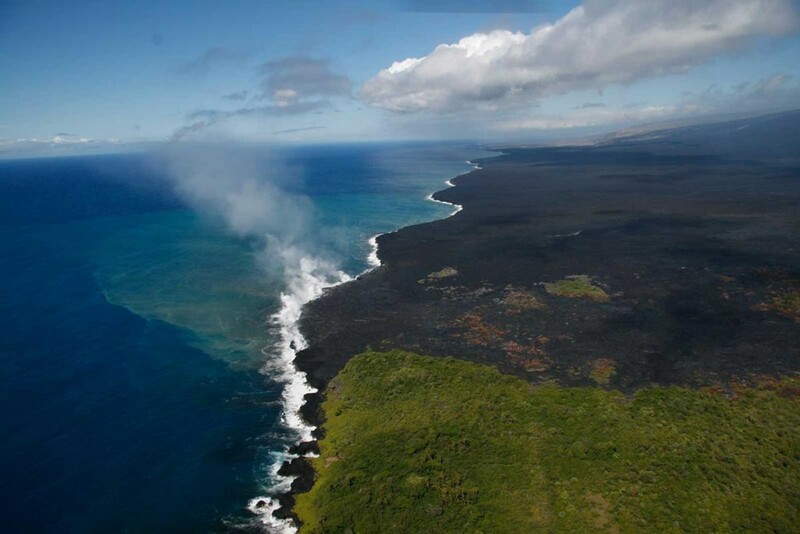 Virgin coastline is seen as it is created on Hawaii’s Big Island near the town of Kalapana. Kalapana is now partially buried beneath new earth–lava that flowed down from one of Mauna Loa’s vents, covering the landscape with rich but barren rock. Here the coast is ever-changing. New lava flows have been bringing new earth to this spot consistently for several decades now. Steam rises from the sea as molten rock pushes into new spaces, solidifying and building a lava shelf. Soon, the lava shelf will collapse under its weight. As this process repeats, eventually the island grows. Hawaii is one of only a handful of places on the planet where we can witness this tremendous, powerful event with our own eyes.